Modern, contemporary and elegent with an interior providing unsurpassed comfort, and a cleverly designed hull underbody able to handle North Sea conditions yet have greatly improved fuel economy with its superior underbody reducing drag. The large inverted chine reduces spray, will act as a stabiliser reducing roll, and assist the forward movement by funelling water aft. 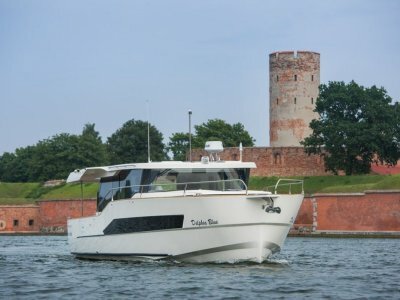 Light bright interior has all the comforts of home, with all the facilities available for long range coastal cruising.. The smart elegance of the BLUESCAPE 1200 can be seen in its exterior and interior lines and appointments. The interior reflects the very latest in trends in high quality design, fabrics and materials, making the boat feel like a luxury apartment on the water, and simply being aboard it is a pleasure. The hull captures your attention with its combination of unique lines and design pedigree. The wide awnings aft are ideal for Australian conditions providing good shade from our sunny weather. 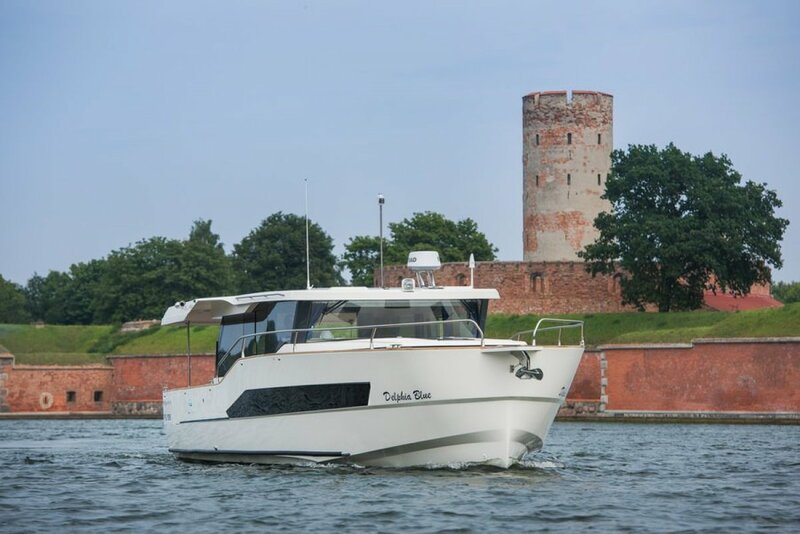 The Bluescape 1200 is easy to manouver and this can be enhanced with optional bow and stern thrusters. Safe and comfortable boating is assured. Many engine options are available, from 50hp for calm waters, both single and twin engine installations up to 280hp. Bluescape has been rewarded with the European Best of Boats 2017 award in the catagory Best for Travel, and nominated for the European Boat of The Year 2018 in the displacement catagory. DELPHIA YACHTS AND POWERBOATS continue to win awards years after year with their superior design, engineering and quality of construction. An huge acheivement in design sucees with the collaboration of Naval architects Andrzej Skratz and Tony Castro of superyacht renown. Boat is priced as per specififications in this ad, many options included but many options are available with price adjustments. 140HP 4 cylinder Kubota diesel, marinised by Nanni, shaft driven 4 blade prop. Many engine options available. Wired 240vac and 12vdc, with master switching and switchboards, interior LED lighting, gaugles for voltage, fuel level water level nad holding tank level. 3 x USB 5V sockets, double 240v sockets in galley and saloon, 2 x 110AH AGM batteries for house, 1 x 110ah start battery, 2 x 110ah agm bow thruster batteries. 1600W invertor with Battery charger, 40amp with 25m shore power lead. Fusion stereo, am/fm/ipod/usb/bluetooth, 2 speakers, lpg solenoid valve in gas locker with detector at stove.